Philanthropy. It’s supposed to make you happy. But in my experience, too often it creates anxiety and stress. Instead of looking at it as a benefit to donors, professionals, clients…the world, we focus on the one part guaranteed to bring misery. “Hi, would you give me money to support this amazing program that has been around for 70 years, in 5 different locations, serving 1200….” And you know. No one cares. Really. We get so hung up on the things that do not matter. At least not to the larger body of people who would really like to help you. Think about it. A natural disaster occurs and people don’t care what the magnitude of the earthquake, the runup of the tsunami, the temperature of the fire. They care—deeply—that others are in pain, need help, and lives could be made better. And then they dig deeply into their pockets and support whatever. Words don’t do it. Emotion does. But we in the philanthropy business spend untold hours trying to find the right way to tell someone about what we do; we memorize numbers and statistics and really really really and truly—no one cares. When I was raising money, what worked was finding out what mattered to my prospect. What did he or she care about. Sometimes it was the organization or the cause. Often, however, it was something else that my organization could get its arms around. One donor I worked with cared deeply about getting really smart people in one discipline into a room with equally smart people in another discipline—and seeing what happened. He wanted to be there at the creation and when we figured out how to make that a regular occurrence, he make a really big gift. Some people only care about putting their names in lights. Others care about getting access to certain folk. Some only want to make a difference. It doesn’t matter. There is no one good way to be philanthropic. Our job as professionals is to make sure that donors get what they want while filling a need of our organization. For that, you do have to be as willing to say no as you are to say yes. If the gift doesn’t meet your criteria or match the needs you have, be gracious and thankful, but say no firmly. And tell the would-be donor what would make sense. It might just make sense to her, also. Finding out what makes sense requires conversations. It means listening more than you are talking. But it also requires you to know where that conversation needs to go. Spending too much time talking about a prospect’s pet peeve or new toy will not move that prospect to become a donor. You must be thoughtful about your needs—and your donor’s. 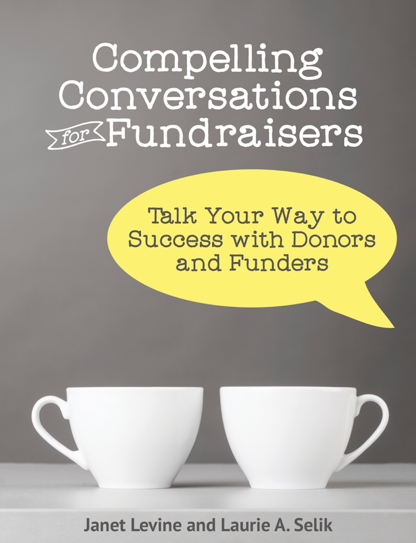 And then figure out ways to connect those dots and tie your donor to your organization. This entry was posted in fundraising and tagged caring, connecting dots, conversations, fundraising, Philanthropy. Bookmark the permalink.